A man reads WhatsApp advertisements on how to spot misinformation, published in prominent newspapers in New Delhi, India, July 10, 2018. After hoax messages on WhatsApp fueled deadly mob violence in India, the Facebook-owned messaging platform published full-page advertisements in prominent English and Hindi language newspapers advising users on how to spot misinformation. The advertisements are the first measure taken by the social media company to raise awareness about fake messages, following a warning by the Indian government that it needs to take immediate action to curb the spread of false information. 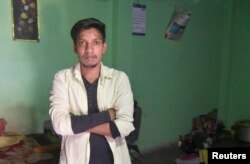 While India is not the only country to be battling the phenomenon of fake messaging on social media, it has taken a menacing turn here — in the past two months more than a dozen people have died in lynchings sparked by false posts spread on WhatsApp that the victims were child kidnappers. 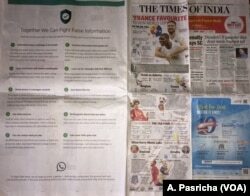 Ironically, the digital media giant took recourse to traditional print media to disseminate its message. The advertisements, which began with the line “Together we can fight false information” give 10 tips on how to sift truth from rumors and will also be placed in regional language newspapers. They call on users to check photos in messages carefully because photos and videos can be edited to mislead; check out stories that seem hard to believe; to “think twice before sharing a post that makes you angry and upset”; check out other news websites or apps to see if the story is being reported elsewhere. It also warned that fake news often goes viral and asked people not to believe a message just because it is shared many times. WhatsApp published full page advertisements in The Times of India newspaper giving 10 tips on how to fight false information. Internet experts called the media blitz a good first step, but stressed the need for a much larger initiative to curb the spread of fake messages that authorities are struggling to tackle. Some pointed out that although newspapers are popular in India, many of the users of the messaging platform, specially in rural areas, were unlikely to be newspaper readers. Satish Bhaykre, 21, who was beaten by a mob due to a fake WhatsApp text, poses inside his house on the outskirts of Nagpur, India, June 23, 2018. The fake posts that have spread on WhatsApp have ranged from sensationalist warnings of natural calamities, fake stories with political messaging to bogus medical advise. The false messages that warned parents about child abductors were sometimes accompanied by gruesome videos of child abuse. Experts said the that the need to curb fake news has also assumed urgency ahead of India’s general elections scheduled for next year — WhatsApp has become the favored medium for political parties to target voters. With about 200 million users, India is its largest market for the messaging service.